This post is less about me teaching you how to cook something unique and more about teaching you how to cook something flavorful that you can do in advance and use for multiple purposes in a simple way. 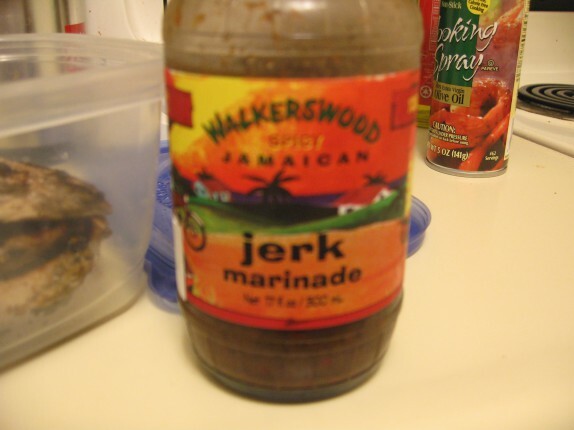 I then marinated the chicken in my favorite jerk marinade (about 1 tablespoon per 0.5 lb of chicken, so, duh, 3 tablespoons), Walkerswood, recommended to me by Chef Chuck Hughes via twitter. I scoured the area for this stuff. When I finally couldn’t find it, Cassie bought me some of it and the jerk seasoning paste/rub for our one year of being together celebration. 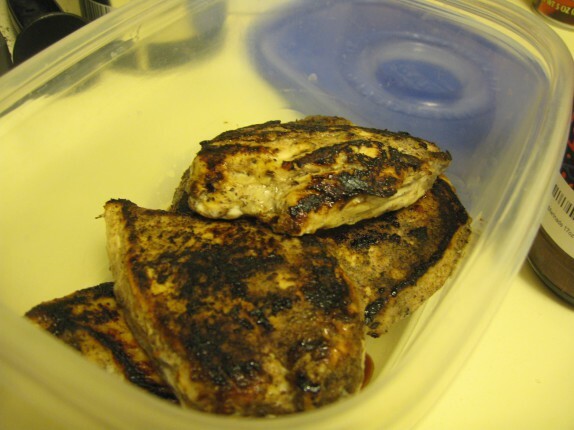 After 2 days of sitting in this marinade (in which time the amount of liquid had doubled due to the osmotic effect of the salt in the marinade pulling moisture from the chicken), I grilled them up on a hot skillet that I sprayed with cooking spray. I placed the grilled chicken breasts in my second finest piece of Gladware for storage.